We can all be forgiven, seeing as we do all these nasty reports about policemen each and every night on the news, that all cops are crooked. What the news shows seldom – if ever – show us is the other side of being a policeman: the cop who goes about his daily business as is expected of a public servant. Tyrone del Rosario of the high school class of 1994 was not my student. Around the time that he graduated, I was teaching only one or two sections and had gone more and more into administrative work. He was, however, in my football team. When I was with my teams – I loved to tell my players often enough – I was every bit as coach a teacher as the one with the chalk and eraser. In a manner of speaking, therefore, Tyrone my player was also, in effect, my student. He was a diminutive little imp of a player. He made up for his lack of stature, however, by being brave and determined, one of those tireless little workers who hated being beaten and fought hard for the cause. The son of Rodrigo – now deceased – and Chelchita del Rosario, Tyrone and his older brother Monte Martin grew up in the city of Mamburao in Occidental Mindoro. For their high school education, however, the brothers went to live with relatives in Lipa. Even at a young age, Tyrone had one burning ambition – to serve the community as well as the country by becoming a policeman. That was why, straight from high school, he enrolled at the University of Manila in pursuit of a bachelor’s degree in Criminology. 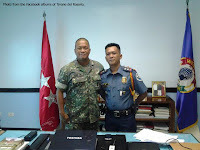 Late in 2001, with his degree finally earned, he headed off to Camp Nakar in Lucena to join fellow recruits from around the country in undergoing the Philippine National Police’s Public Safety Basic Recruit Course. He graduated six months later with the rank of Police Officer II. 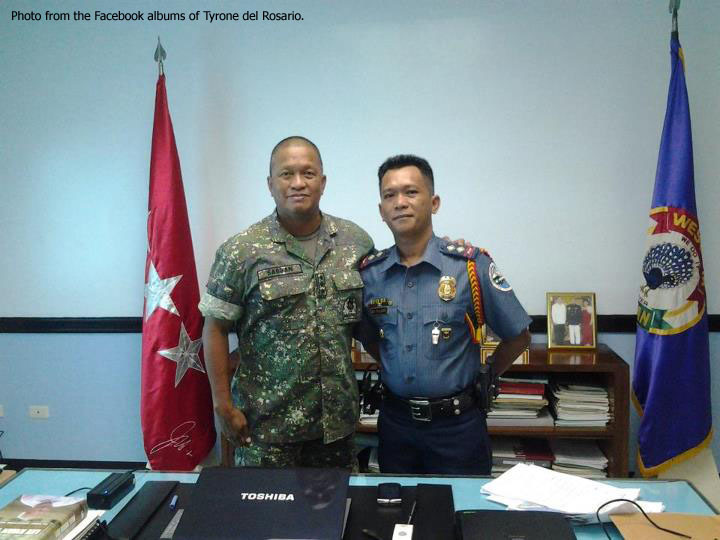 In 2003, Tyrone went through the PNP’s Special Counter-Insurgency Unit Training or SCOUT. The training was a rigid 45-day course which equipped selected policemen with skills that they would need in internal security or counter-insurgency assignments. 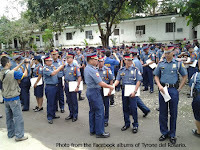 In 2008, he became an officer of the PNP by way of its Lateral Entry Program. 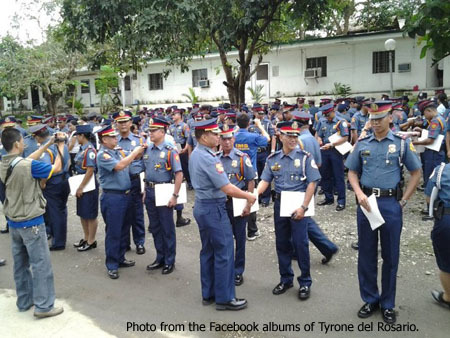 This program allows entry into the PNP by people with highly specialized qualifications. He was required to take the Officers’ Basic Course also in Camp Nakar and was awarded the rank of Police Inspector or what is in other armed services called the 2nd Lieutenant. 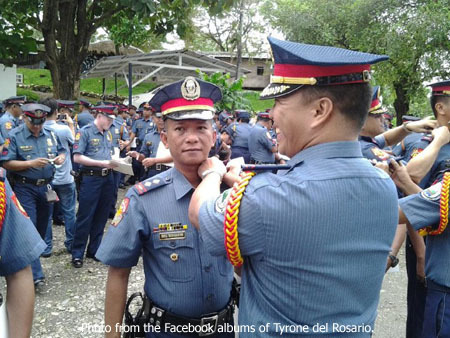 Recently, Tyrone was promoted to the rank of Captain and given a new assignment in Palawan. Previously, he had been assigned to the largely agrarian municipalities of Abra de Ilog and Sablayan in his home province of Occidental Mindoro. Both assignments were for counter-insurgency operations. It is a dangerous life, Tyrone admits; and probably this aspect of being a policeman is seldom shown to the public by the media. “While conducting road security one day,” he narrates, “we were ambushed. It was my baptism of fire. Bullets were raining all over us and we could not tell where they were coming from.” It is an aspect of the life of a policeman that men in uniform have to live with but is seldom brought to the attention of the public. 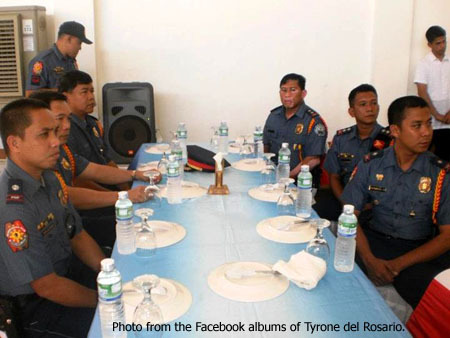 Tyrone is married to the former Shali Mae Piedad and has two children. Terence Jacob is six years old while Tracey Samantha is four. There is one visit that every policeman’s wife dreads will ever come – that of a senior officer to tell her that she has become a widow. Suffice it to say that it is a bit of an understatement to say that being a policeman is a strange way to make a living. While in other careers, acts of heroism are rare and celebrated when they occur, with policemen it is an expectation and a way of life. He has lost count of the number of times when he and fellow policemen had been called to provide covering fire so that others could gain advantageous positions over outlaws. If he has any say about it at all, what image of the PNP does Tyrone wish the public to have of the organization that he so faithfully serves? The President’s promises in the recent state-of-the-nation address ought to be music to Tyrone’s ears; although when the promised upgrades will materialize is something for government – and clairvoyants – to say. With government, sometimes you just never know. 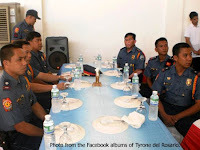 Meanwhile, Tyrone says that he is happy and contented with not only his married life but also in the knowledge that he is serving his countrymen. He spends his spare time with his family, reading books or playing airsoft with friends. He knows that the wrongdoings of certain elements within the PNP sometimes make the public wary of policemen like him. Although it will probably take time, Tyrone would like nothing more than for the public to know that he and others like him are, rather than being seen as the enemy, instead truly on its side.